"Chinese yuan" redirects here. For the unit of currency, see Yuan (currency). "Chinese money" redirects here. For Ancient Chinese currency, see Ancient Chinese coinage. "CNY" and "RMB" redirect here. For other uses, see CNY (disambiguation) and RMB (disambiguation). Renminbi banknotes of the 2005 series. Until 2005, the value of the renminbi was pegged to the US dollar. As China pursued its transition from central planning to a market economy, and increased its participation in foreign trade, the renminbi was devalued to increase the competitiveness of Chinese industry. It has previously been claimed that the renminbi's official exchange rate was undervalued by as much as 37.5% against its purchasing power parity. More recently, however, appreciation actions by the Chinese government, as well as quantitative easing measures taken by the American Federal Reserve and other major central banks, have caused the renminbi to be within as little as 8% of its equilibrium value by the second half of 2012. Since 2006, the renminbi exchange rate has been allowed to float in a narrow margin around a fixed base rate determined with reference to a basket of world currencies. The Chinese government has announced that it will gradually increase the flexibility of the exchange rate. As a result of the rapid internationalization of the renminbi, it became the world's 8th most traded currency in 2013, and 5th by 2015. On 1 October 2016, the RMB became the first emerging market currency to be included in the IMF's special drawing rights basket, the basket of currencies used by the IMF (reserve currency). The ISO code for renminbi (which may also be used for the yuan) is CNY (an abbreviation for "Chinese yuan"), or also CNH when traded in off-shore markets such as Hong Kong. The currency is often abbreviated RMB, or indicated by the yuan sign ¥. The latter may be written CN¥ to distinguish it from other currencies with the same symbol (such as the Japanese yen). In Chinese texts the currency may also be indicated with the Chinese character for the yuan, 圆 (or 元 informally). The renminbi is legal tender in mainland China, but not in Hong Kong or Macau. However, Renminbi is widely accepted in Hong Kong and Macau, and are easily exchanged in the two territories, with banks in Hong Kong allowing people to maintain accounts in RMB and withdraw RMB banknotes from ATM terminals. 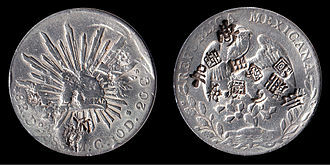 In 1889, the yuan was equated at par with the Mexican peso, a silver coin deriving from the Spanish dollar which circulated widely in southeast Asia since the 17th century due to Spanish presence in the Philippines and Guam. It was subdivided into 1000 cash (Chinese: 文; pinyin: wén), 100 cents or fen (Chinese: 分; pinyin: fēn), and 10 jiao (Chinese: 角; pinyin: jiǎo, cf. dime). It replaced copper cash and various silver ingots called sycees. The sycees were denominated in tael. The yuan was valued at 0.72 tael, (or 7 mace and 2 candareens). The earliest issues were silver coins produced at the Guangdong mint, known in the West at the time as Canton, and transliterated as Kwangtung, in denominations of 5 cents, 1, 2 and 5 jiao and 1 yuan. Other regional mints were opened in the 1890s producing similar silver coins along with copper coins in denominations of 1, 2, 5, 10 and 20 cash. Other regional mints were opened in the 1890s. The central government began issuing its own coins in the yuan currency system in 1903. Banknotes were issued in yuan denominations from the 1890s by several local and private banks, along with banks established by the Imperial government. The central government began issuing its own coins in the yuan currency system in 1903. These were brass 1 cash, copper 2, 5, 10 and 20 cash, and silver 1, 2 and 5 jiao and 1 yuan. After the revolution, although the designs changed, the sizes and metals used in the coinage remained mostly unchanged until the 1930s. From 1936, the central government issued nickel (later cupronickel) 5, 10 and 20 fen and ​1⁄2 yuan coins. Aluminium 1 and 5 fen pieces were issued in 1940. 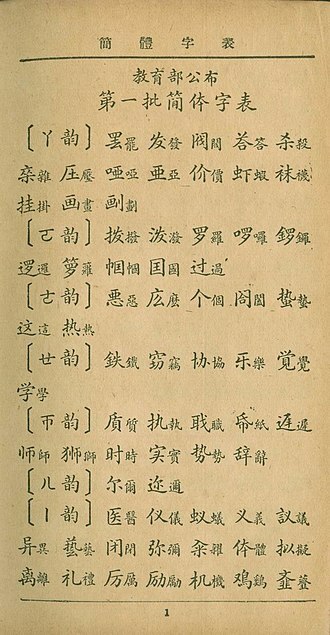 A variety of currencies circulated in China during the Republic of China (ROC) era, most of which were denominated in the unit yuán (Mandarin pronunciation in IPA: [ɥæ̌n˧˥]). Each was distinguished by a currency name, such as the fabi ("legal tender"), the "gold yuan", and the "silver yuan". The renminbi was introduced by the People's Bank of China in December 1948, about a year before the establishment of the People's Republic of China. It was issued only in paper money form at first, and replaced the various currencies circulating in the areas controlled by the Communists. 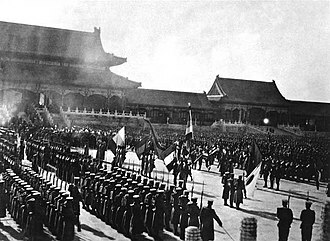 One of the first tasks of the new government was to end the hyperinflation that had plagued China in the final years of the Kuomintang (KMT) era. That achieved, a revaluation occurred in 1955 at the rate of 1 new yuan = 10,000 old yuan. 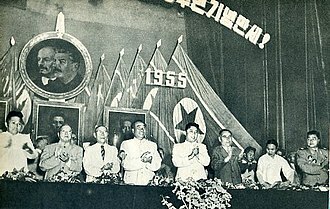 As the Communist Party of China took control of ever larger territories in the latter part of the Chinese Civil War, its People's Bank of China began in 1948 to issue a unified currency for use in Communist-controlled territories. Also denominated in yuan, this currency was identified by different names, including "People's Bank of China banknotes" (simplified Chinese: 中国人民银行钞票; traditional Chinese: 中國人民銀行鈔票; from November 1948), "New Currency" (simplified Chinese: 新币; traditional Chinese: 新幣; from December 1948), "People's Bank of China notes" (simplified Chinese: 中国人民银行券; traditional Chinese: 中國人民銀行券; from January 1949), "People's Notes" (人民券, as an abbreviation of the last name), and finally "People's Currency", or "renminbi", from June 1949. From 1949 until the late 1970s, the state fixed China's exchange rate at a highly overvalued level as part of the country's import-substitution strategy. During this time frame, the focus of the state's central planning was to accelerate industrial development and reduce China's dependence on imported manufactured goods. The overvaluation allowed the government to provide imported machinery and equipment to priority industries at a relatively lower domestic currency cost than otherwise would have been possible. China's transition by the mid-1990s to a system in which the value of its currency was determined by supply and demand in a foreign exchange market was a gradual process spanning 15 years that involved changes in the official exchange rate, the use of a dual exchange rate system, and the introduction and gradual expansion of markets for foreign exchange. The most important move to a market-oriented exchange rate was an easing of controls on trade and other current account transactions, as occurred in several very early steps. In 1979 the State Council approved a system allowing exporters and their provincial and local government owners to retain a share of their foreign exchange earnings, referred to as foreign exchange quotas. At the same time, the government introduced measures to allow retention of part of the foreign exchange earnings from non-trade sources, such as overseas remittances, port fees paid by foreign vessels, and tourism. 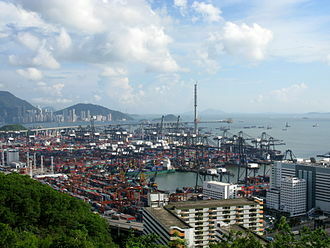 As early as October 1980, exporting firms that retained foreign exchange above their own import needs were allowed to sell the excess through the state agency responsible for the management of China's exchange controls and its foreign exchange reserves, the State Administration of Exchange Control. Beginning in the mid-1980s, the government sanctioned foreign exchange markets, known as swap centers eventually in most large cities. The government also gradually allowed market force to take the dominant role by introducing an "internal settlement rate" of RMB 2.8 to 1 US dollar which was a devaluation of almost 100 percent. In November 1993 the Third Plenum of the Fourteenth CPC Central Committee approved a comprehensive reform strategy in which foreign exchange management reforms were highlighted as a key element for a market-oriented economy. A floating exchange rate regime and convertibility for RMB were seen as the ultimate goal of the reform. Conditional convertibility under current account was achieved by allowing firms to surrender their foreign exchange earning from current account transactions and purchase foreign exchange as needed. Restrictions on Foreign Direct Investment (FDI) was also loosened and capital inflows to China surged. During the era of the command economy, the value of the renminbi was set to unrealistic values in exchange with western currency and severe currency exchange rules were put in place. With the opening of the Chinese economy in 1978, a dual-track currency system was instituted, with renminbi usable only domestically, and with foreign visitors to China forced to use foreign exchange certificates. The unrealistic levels at which exchange rates were pegged led to a strong black market in currency transactions. In the late 1980s and early 1990s, China worked to make the RMB more convertible. Through the use of swap centres, the exchange rate was brought to realistic levels and the dual track currency system was abolished. As of 2013, the renminbi is convertible on current accounts but not capital accounts. The ultimate goal has been to make the RMB fully convertible. However, partly in response to the Asian financial crisis in 1998, China has been concerned that the Chinese financial system would not be able to handle the potential rapid cross-border movements of hot money, and as a result, as of 2012, the currency trades within a narrow band specified by the Chinese central government. Following the Internationalization of the renminbi, on 30 November 2015, the IMF voted to designate the renminbi as one of several main world currencies, thus including it in the basket of special drawing rights. The RMB became the first emerging market currency to be included in the IMF's SDR basket on 1 October 2016. The other main world currencies are the United States dollar, euro, British pound, and Japanese yen. As of 2019, renminbi banknotes are available in denominations from ¥0.1, ¥0.5 (1 and 5 jiao), ¥1, ¥5, ¥10, ¥20, ¥50 and ¥100 yuan. These denominations have been available since 1955, except for the 20, 50 and 100 yuan notes (added in 1999). Coins are available in denominations from 1 fen to 1 yuan (¥0.01–1). Thus some denominations exist in both coins and banknotes. On rare occasions larger yuan coin denominations such as ¥5 have been issued to commemorate events but use of these outside of collecting has never been widespread. The denomination of each banknote is printed in Chinese language. 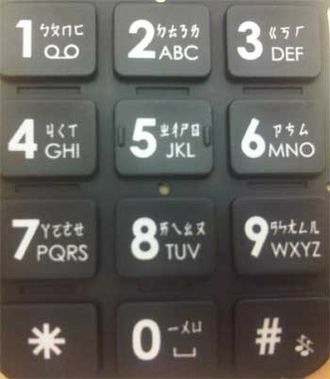 The numbers themselves are printed in financial Chinese numeral characters, as well as Arabic numerals. The denomination and the words "People's Bank of China" are also printed in Mongolian, Tibetan, Uyghur and Zhuang on the back of each banknote, in addition to the boldface Hanyu Pinyin "Zhongguo Renmin Yinhang" (without tones). The right front of the note has a tactile representation of the denomination in Chinese Braille starting from the fourth series. See corresponding section for detailed information. The fen and jiao denominations have become increasingly unnecessary as prices have increased. Coins under ¥0.1 are used infrequently. Chinese retailers tend to avoid decimal values (such as ¥9.99), opting instead for integer values of yuan (such as ¥9 or ¥10). In 1953, aluminium 1-, 2-, and 5-fen coins began being struck for circulation, and were first introduced in 1955. These depict the national emblem on the obverse (front) and the name and denomination framed by wheat stocks on the reverse (back). In 1980, brass 1-, 2-, and 5-jiao and cupro-nickel 1-yuan coins were added, although the 1 and 2 jiao were only produced until 1981, with the last 5 jiao and 1 yuan issued in 1985. All jiao coins depicted similar designs to the fen coins while the yuan depicted the Great Wall of China. In 1991, a new coinage was introduced, consisting of an aluminium 1 jiao, brass 5 jiao and nickel-clad-steel 1 yuan. These were smaller than the previous jiao and yuan coins and depicted flowers on the obverse and the national emblem on the reverse. 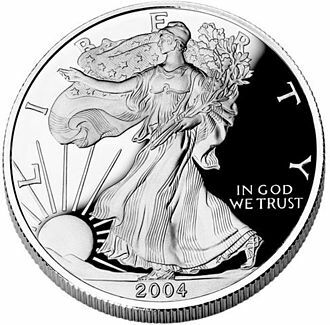 Issuance of the aluminum 1- and 2-fen coins ceased in 1991, with that of the 5 fen halting in 1994. The small coins were still made for annual uncirculated mint sets in limited quantities, and from the beginning of 2005 the 1-fen coin got a new lease on life by being issued again every year since then up to present. New designs of the 1 and 5 jiao and 1 yuan were again introduced in between 1999 and 2002, with the 1 jiao being significantly reduced in size. In 2005, the metallic composition of the 1 jiao was changed from aluminum to more durable nickel-plated steel. The frequency of usage of coins varies between different parts of China, with coins typically being more popular in urban areas, and small notes being more popular in rural areas. Older fen and large jiao coins are uncommonly still seen in circulation but are still valid in exchange. The first series of renminbi banknotes was issued on 1 December 1948, by the newly founded People's Bank of China. It introduced notes in denominations of 1, 5, 10, 20, 50, 100 and 1000 yuan. Notes for 200, 500, 5000 and 10,000 yuan followed in 1949, with 50,000 yuan notes added in 1950. A total of 62 different designs were issued. The notes were officially withdrawn on various dates between 1 April and 10 May 1955. The name "first series" was given retroactively in 1950, after work began to design a new series. These first renminbi notes were printed with the words "People's Bank of China", "Republic of China", and the denomination, written in Chinese characters by Dong Biwu. The second series of renminbi banknotes was introduced on 1 March 1955 (but dated 1953). Each note has the words "People's Bank of China" as well as the denomination in the Uyghur, Tibetan, Mongolian and Zhuang languages on the back, which has since appeared in each series of renminbi notes. 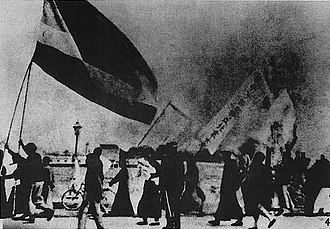 The denominations available in banknotes were ¥0.01, ¥0.02, ¥0.05, ¥0.1, ¥0.2, ¥0.5, ¥1, ¥2, ¥3, ¥5 and ¥10. Except for the three fen denominations and the 3 yuan which were withdrawn, notes in these denominations continued to circulate. Good examples of this series have gained high status with banknote collectors. The third series of renminbi banknotes was introduced on 15 April 1962, though many denominations were dated 1960. New dates would be issued as stocks of older dates were gradually depleted. The sizes and design layout of the notes had changed but not the order of colors for each denomination. For the next two decades, the second and third series banknotes were used concurrently. 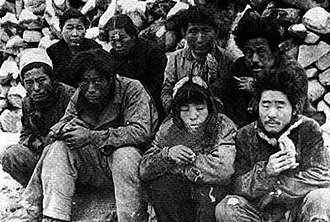 The denominations were of ¥0.1, ¥0.2, ¥0.5, ¥1, ¥2, ¥5 and ¥10. The third series was phased out during the 1990s and then was recalled completely on 1 July 2000. The fourth series of renminbi banknotes was introduced between 1987 and 1997, although the banknotes were dated 1980, 1990, or 1996. They are still legal tender. Banknotes are available in denominations of ¥0.1, ¥0.2, ¥0.5, ¥1, ¥2, ¥5, ¥10, ¥50 and ¥100. Like previous issues, the color designation for already existing denominations remained in effect. The fifth series of renminbi banknotes and coins was progressively introduced from 1999. This series also bears the years 2005 (all except ¥1) and 2015 (¥100 only). As of 2016, it includes banknotes for ¥1, ¥5, ¥10, ¥20, ¥50 and ¥100. Significantly, the fifth series uses the portrait of Mao Zedong on all banknotes, in place of the various leaders and workers which had been featured previously. During this series new security features were added, the ¥2 denomination was discontinued, and the color pattern for each note was changed. In 1999, a commemorative red ¥50 note was issued in honor of the 50th anniversary of the establishment of the People's Republic of China. This note features Mao Zedong on the front and various animals on the back. An orange polymer note, and so far, China's only polymer note, commemorating the new millennium was issued in 2000 with a face value of ¥100. This features a dragon on the obverse and the reverse features the China Millennium monument (at the Center for Cultural and Scientific Fairs). For the 2008 Beijing Olympics, a green ¥10 note was issued featuring the Bird's Nest Stadium on the front with the back showing a classical Olympic discus thrower and various other athletes. On 26 November 2015, the People's Bank of China issued a blue ¥100 commemorative note to commemorate aerospace science and technology. In commemoration of the 70th Anniversary of the issuance of the Renminbi, the People's Bank of China issued 120 million ¥50 banknotes on December 28, 2018. The second series of the renminbi had the most readable minority languages text, but no Zhuang text on it. Its issue of ¥0.1–¥0.5 even highlighted the Mongolian text. "People's Bank of China Ten Yuan" written in 5 different languages. From top to bottom and left to right: Mandarin pinyin, Mongolian, Tibetan, Uyghur, and Zhuang languages. A special edition designed for Inner Mongolia in the first series of the renminbi. The renminbi yuan has different names when used in minority regions. When used in Inner Mongolia and other Mongol autonomies, a yuan is called a tugreg (Mongolian: ᠲᠦᠭᠦᠷᠢᠭ᠌, тѳгрѳг tügürig). 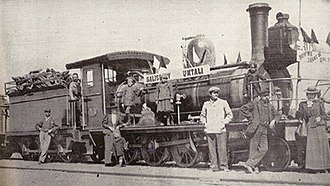 However, when used in the republic of Mongolia, it is still named yuani (Mongolian: юань) to differentiate it from Mongolian tögrög (Mongolian: төгрөг). 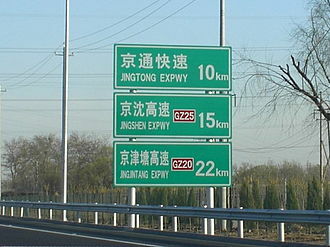 One Chinese tügürig (tugreg) is divided into 100 mönggü (Mongolian: ᠮᠥᠩᠭᠦ, мөнгө), one Chinese jiao is labeled "10 mönggü". In Mongolian, renminbi is called aradin jogos or arad-un jogos (Mongolian: ᠠᠷᠠᠳ ᠤᠨ ᠵᠣᠭᠣᠰ, ардын зоос arad-un ǰoγos). When used in Tibet and other Tibetan autonomies, a yuan is called a gor (Tibetan: སྒོར་, ZYPY: Gor). One gor is divided into 10 gorsur (Tibetan: སྒོར་ཟུར་, ZYPY: Gorsur) or 100 gar (Tibetan: སྐར་, ZYPY: gar). In Tibetan, renminbi is called mimangxogngü (Tibetan: མི་དམངས་ཤོག་དངུལ།, ZYPY: Mimang Xogngü) or mimang shog ngul. Renminbi currency production is carried out by a state owned corporation, China Banknote Printing and Minting Corporation (CBPMC; 中国印钞造币总公司) headquartered in Beijing. CBPMC uses several printing, engraving and minting facilities around the country to produce banknotes and coins for subsequent distribution. Banknote printing facilities are based in Beijing, Shanghai, Chengdu, Xi'an, Shijiazhuang, and Nanchang. 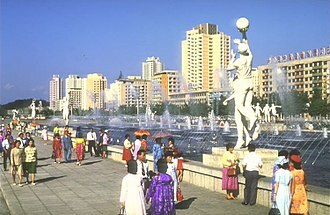 Mints are located in Nanjing, Shanghai, and Shenyang. Also, high grade paper for the banknotes is produced at two facilities in Baoding and Kunshan. The Baoding facility is the largest facility in the world dedicated to developing banknote material according to its website. In addition, the People's Bank of China has its own printing technology research division that researches new techniques for creating banknotes and making counterfeiting more difficult. On 13 March 2006, some delegates to an advisory body at the National People's Congress proposed to include Sun Yat-sen and Deng Xiaoping on the renminbi banknotes. However, the proposal was not adopted. For most of its early history, the RMB was pegged to the U.S. dollar at ¥2.46 per USD (note: during the 1970s, it was revalued until it reached ¥1.50 per USD in 1980). When China's economy gradually opened in the 1980s, the RMB was devalued in order to improve the competitiveness of Chinese exports. 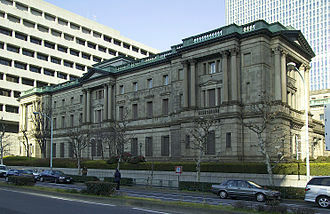 Thus, the official exchange rate increased from ¥1.50 in 1980 to ¥8.62 by 1994 (the lowest rate on record). Improving current account balance during the latter half of the 1990s enabled the Chinese government to maintain a peg of ¥8.27 per USD from 1997 to 2005. The RMB reached a record high exchange value of ¥6.0395 to the U.S. dollar on 14 January 2014. Chinese leadership have been raising the yuan to tame inflation, a step U.S. officials have pushed for years to lower the massive trade deficit with China. Strengthening the value of the RMB also fits with the Chinese transition to a more consumer-led economic growth model. In 2015 the People's Bank of China again devalued their country's currency. As of 1 September 2015[update], the exchange rate for 1 USD is ¥6.38. On 21 July 2005, the peg was finally lifted, which saw an immediate one-time RMB revaluation to ¥8.11 per USD. The exchange rate against the euro stood at ¥10.07060 yuan per euro. However the peg was reinstituted unofficially when the financial crisis hit: "Under intense pressure from Washington, China took small steps to allow its currency to strengthen for three years starting in July 2005. But China 're-pegged' its currency to the dollar as the financial crisis intensified in July 2008." On 19 June 2010, the People's Bank of China released a statement simultaneously in Chinese and English indicating that they would "proceed further with reform of the RMB exchange rate regime and increase the RMB exchange rate flexibility". The news was greeted with praise by world leaders including Barack Obama, Nicolas Sarkozy and Stephen Harper. The PBoC maintained there would be no "large swings" in the currency. The RMB rose to its highest level in five years and markets worldwide surged on Monday, 21 June following China's announcement. In August 2015, Joseph Adinolfi, a reporter for MarketWatch, reported that China had re-pegged the RMB. In his article, he narrated that "Weak trade data out of China, released over the weekend, weighed on the currencies of Australia and New Zealand on Monday. But the yuan didn’t budge. Indeed, the Chinese currency, also known as the renminbi, has been remarkably steady over the past month despite the huge selloff in China’s stock market and a spate of disappointing economic data. Market strategists, including Simon Derrick, chief currency strategist at BNY Mellon, and Marc Chandler, head currency strategist at Brown Brothers Harriman, said that’s because China’s policy makers have effectively re-pegged the yuan. “When I look at the dollar-renminbi right now, that looks like a fixed exchange rate again. They’ve re-pegged it,” Chandler said." The RMB has now moved to a managed floating exchange rate based on market supply and demand with reference to a basket of foreign currencies. In July 2005, the daily trading price of the U.S. dollar against the RMB in the inter-bank foreign exchange market was allowed to float within a narrow band of 0.3% around the central parity  published by the People's Bank of China; in a later announcement published on 18 May 2007, the band was extended to 0.5%. On 14 April 2012, the band was extended to 1.0%. On 17 March 2014, the band was extended to 2%. China has stated that the basket is dominated by the United States dollar, euro, Japanese yen and South Korean won, with a smaller proportion made up of the British pound, Thai baht, Russian ruble, Australian dollar, Canadian dollar and Singapore dollar. On 10 April 2008, it traded at ¥6.9920 per US dollar, which was the first time in more than a decade that a dollar had bought less than seven yuan, and at 11.03630 yuan per euro. Beginning in January 2010, Chinese and non-Chinese citizens have an annual exchange limit of a maximum of US$50,000. Exchange will only proceed if the applicant appears in person at the relevant bank, and presents their passport or Chinese ID; these deals are being centrally registered. The maximum dollar withdrawal is $10,000 per day, the maximum purchase limit of USD is $500 per day. This stringent management of the currency leads to a bottled-up demand for exchange in both directions. It is viewed as a major tool to keep the currency peg, preventing inflows of 'hot money'. A shift of Chinese reserves into the currencies of their other trading partners has caused these nations to shift more of their reserves into dollars, leading to no great change in the value of the renminbi against the dollar. Renminbi futures are traded at the Chicago Mercantile Exchange. The futures are cash-settled at the exchange rate published by the People's Bank of China. Scholarly studies suggest that the yuan is undervalued on the basis of purchasing power parity analysis. One 2011 study suggests a 37.5% undervaluation. The World Bank estimated that, by purchasing power parity, one International dollar was equivalent to approximately ¥1.9 in 2004. The International Monetary Fund estimated that, by purchasing power parity, one International dollar was equivalent to approximately ¥3.462 in 2006, ¥3.621 in 2007, ¥3.798 in 2008, ¥3.872 in 2009, ¥3.922 in 2010, ¥3.946 in 2011, ¥3.952 in 2012, ¥3.944 in 2013 and ¥3.937 in 2014. The People's Bank of China lowered the renminbi's daily fix to the US dollar by 1.9 per cent to ¥6.2298 on 11 August 2015. The People's Bank of China again lowered the renminbi's daily fix to the US dollar from ¥6.620 to ¥6.6375 after the Brexit on 27 June 2016. It had not been this low since December 2010. Before 2009, the Chinese renminbi had little to no exposure in the international markets because of strict government controls by the central Chinese government that prohibited almost all export of the currency, or use of it in international transactions. 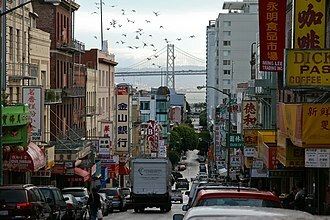 Transactions between Chinese companies and a foreign entity were generally denominated in US dollars. With Chinese companies unable to hold US dollars and foreign companies unable to hold Chinese yuan, all transactions would go through the People's Bank of China. Once the sum was paid by the foreign party in dollars, the central bank would pass the settlement in renminbi to the Chinese company at the state-controlled exchange rate. In June 2009 the Chinese officials announced a pilot scheme where business and trade transactions were allowed between limited businesses in Guangdong province and Shanghai, and only counterparties in Hong Kong, Macau, and select ASEAN nations. Proving a success, the program was further extended to 20 Chinese provinces and counterparties internationally in July 2010, and in September 2011 it was announced that the remaining 11 Chinese provinces would be included. In steps intended to establish the renminbi as an international reserve currency, China has agreements with Russia, Vietnam, Sri Lanka, Thailand, and Japan, allowing trade with those countries to be settled directly in renminbi instead of requiring conversion to US dollars, with Australia and South Africa to follow soon. The Chinese government has not taken full responsibilities and commitments on economic affairs at global levels. Renminbi still has not become well-liquidated (fully convertible) yet. The Chinese government still lacks deep and wide vision about how to perform fund-raising to handle international loans at global levels. To meet IMF requirements, China gave up some of its tight control over the currency. 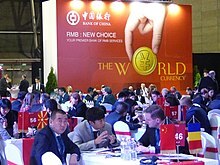 Countries that are left-leaning in the political spectrum had already begun to use the renminbi as an alternative reserve currency to the United States dollar; the Central Bank of Chile reported in 2011 to have US$91 million worth of renminbi in reserves, and the president of the Central Bank of Venezuela, Nelson Merentes, made statements in favour of the renminbi following the announcement of reserve withdrawals from Europe and the United States. In Africa, the central banks of Ghana, Nigeria, and South Africa either hold RMB as a reserve currency or have taken steps to purchase bonds denominated in RMB. The two special administrative regions, Hong Kong and Macau, have their own respective currencies, according to the "one country, two systems" principle and the basic laws of the two territories. Therefore, the Hong Kong dollar and the Macanese pataca remain the legal tenders in the two territories, and renminbi, although sometimes accepted, is not legal tender. Banks in Hong Kong allow people to maintain accounts in RMB. Because of changes in legislation in July 2010, many banks around the world are now slowly offering individuals the chance to hold deposits in Chinese renminbi. The RMB had a presence in Macau even before the 1999 return to the People's Republic of China from Portugal. Banks in Macau can issue credit cards based on the renminbi, but not loans. Renminbi-based credit cards cannot be used in Macau's casinos. The Republic of China, which governs Taiwan, believes wide usage of the renminbi would create an underground economy and undermine its sovereignty. Tourists are allowed to bring in up to ¥20,000 when visiting Taiwan. These renminbi must be converted to the New Taiwan dollar at trial exchange sites in Matsu and Kinmen. The Chen Shui-bian administration insisted that it would not allow full convertibility until the mainland signs a bilateral foreign exchange settlement agreement, though president Ma Ying-jeou has pledged to allow full convertibility as soon as possible. The renminbi circulates in some of China's neighbors, such as Pakistan, Mongolia and northern Thailand. 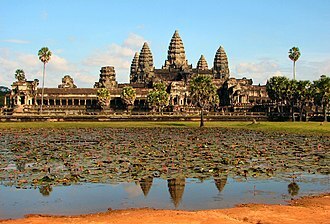 Cambodia welcomes the renminbi as an official currency and Laos and Myanmar allow it in border provinces such as Wa and Kokang and economic zones like Mandalay. Though unofficial, Vietnam recognizes the exchange of the renminbi to the đồng. Since 2007, RMB-nominated bonds are issued outside mainland China; these are colloquially called "dim sum bonds". In April 2011, the first initial public offering denominated in renminbi occurred in Hong Kong, when the Chinese property investment trust Hui Xian REIT raised ¥10.48 billion ($1.6 billion) in its IPO. Beijing has allowed renminbi-denominated financial markets to develop in Hong Kong as part of the effort to internationalise the renminbi. Since currency flows in and out of mainland China are still restricted, RMB traded in off-shore markets, such as the Hong Kong market, can have a different value to RMB traded on the mainland. The offshore RMB market is usually denoted as CNH, but there is another RMB interbank and spot market in Taiwan for domestic trading known as CNT. Other RMB markets include the dollar-settled non-deliverable forward (NDF), and the trade-settlement exchange rate (CNT). Note that the two CNT mentioned above are different from each other. ^ a b c d e "RMB increases its influence in neighbouring areas". People's Daily. 2004-02-17. Retrieved 2007-01-13. ^ Hungwe, Brian. "Zimbabwe's multi-currency confusion". BBC. Retrieved 2014-07-22. 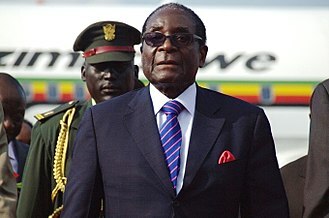 ^ "Zimbabwe to make Chinese yuan legal currency after Beijing cancels debts". The Guardian. 2015-12-21. Retrieved 2015-12-26. ^ Mulvey, Stephen (2010-06-26). "Why China's currency has two names". BBC News. ^ Article 2, "The People's Bank of China Law of the People's Republic of China". 27 December 2003. Archived from the original on 20 March 2007. ^ a b Lipman, Joshua Klein (April 2011). "Law of Yuan Price: Estimating Equilibrium of the Renminbi" (PDF). Michigan Journal of Business. 4 (2). Retrieved 2011-05-23. ^ Schneider, Howard (2012-09-29). "Some experts say China's currency policy is not a danger to the U.S. economy". The Washington Post. ^ a b "RMB now 8th most traded currency in the world". Society for Worldwide Interbank Financial Telecommunication. 2013-10-08. ^ a b "RMB breaks into the top five as a world payments currency". Society for Worldwide Interbank Financial Telecommunication. 2015-01-28. ^ a b Solomon Teague (2016-10-06). "FX: RMB joins the SDR basket". Euromoney. ^ Badkar, Mamta (2014-02-27). "Chinese yuan's drop is largest since its 2005 currency revaluation". Business Insider. Retrieved 2014-03-03. ^ a b Chinese Dragon Coinage Ken Elks, 2000. ^ a b "中华人民共和国第一套人民币概述" [People's Republic of China first RMB Overview]. China: Sina. Retrieved 2012-04-06. ^ Bradsher, Keith (2015-11-30). "China's Renminbi Is Approved by I.M.F. as a Main World Currency". NY Times. Retrieved 2015-11-30. ^ Coldness Kwan (2007-03-06). "Do you get one fen change at Origus?". China Daily. Retrieved 2007-03-26. ^ "中国最早的一张人民币". Cjiyou.net. 2007-10-22. Retrieved 2012-04-06. ^ China new 100-yuan aerospace commemorative note reported for 26.11.2015 introduction BanknoteNews.com. 6 November 2015. Retrieved on 2015-11-18. ^ 中国人民银行公告〔2015〕第33号 The People's Bank of China (www.pbc.gov.cn). Retrieved on 2015-11-18. ^ Quentin Sommerville (2006-03-13). "China mulls Mao banknote change". BBC News, Shanghai. Retrieved 2007-03-18. ^ "Profile of China's Yuan – Characteristics and Economic Indicators". Binary Tribune. ^ Yahoo Finance, Dollar extends slide on views of low US rates Archived 3 May 2011 at the Wayback Machine. Retrieved 2011-04-29. ^ "Is the Renminbi undervalued or overvalued?". CSIS China Power. ^ "Public Announcement of the People's Bank of China on Reforming the RMB Exchange Rate Regime". 21 July 2005. Archived from the original on 16 March 2007. 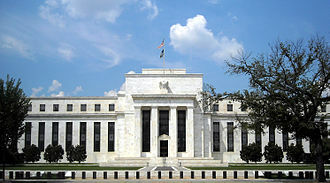 ^ "'Critically important' that China move on currency: Geithner. Treasury chief says he shares Congress' ire over dollar peg". 2010-06-10. ^ Phillips, Michael M.; Talley, Ian (2010-06-21). "Global Leaders Welcome China's Yuan Plan". Wall Street Journal. ^ "World stocks soar after Chinese move on yuan". ^ Adinolfi, Joseph (2015-08-10). "China has effectively re-pegged the yuan". Market Watch. Retrieved 2015-11-28. ^ KWAN, C.H. "How China's managed floating system under BBC rules actually works". RIETI. ^ "Public Announcement of the People's Bank of China on Enlarging the Floating Band of the RMB Trading Prices against the US Dollar in the Inter-bank Spot Foreign Exchange Market". 18 May 2007. Archived from the original on 16 March 2007. ^ "China to widen daily yuan band vs. dollar to 1%". 14 April 2012. Archived from the original on 10 April 2013. ^ Wang, Wynne. "China's Yuan Falls Further Against Dollar". The Wall Street Journal. ^ David Barboza (2008-04-10). "Yuan Hits Milestone Against Dollar". New York Times. Retrieved 2008-04-11. ^ Frangos, Alex (2010-09-16). "Don't Worry About China, Japan Will Finance U.S. Debt". The Wall Street Journal. ^ "Chinese Renminbi Futures" (PDF). CME Group. Retrieved 2010-02-19. ^ "World Economic Outlook Database, April 2009". IMF. Retrieved 2015-01-06. ^ "QFII". Financial Times. Retrieved 2013-10-16. The qualified foreign institutional investor (QFII) programme started in 2002 and allowed licensed foreign institutional investors a quota to buy Chinese-listed A-shares (previously only available to domestic investors). ^ Chris Wright. "ICBC bond: latest step on London's road to RMB dominance". Financial Times. Retrieved 2013-10-16. ^ Joachim Nagel. "The Internationalisation of the Renminbi". Deutsche Bundesbank. Retrieved 2013-10-13. ^ "CDB to issue 5 bln yuan RMB bond in HK". gov.cn. Archived from the original on 5 July 2008. Retrieved 10 October 2013. ^ "Quotes of the Day". Time (magazine). 2010-11-24. Retrieved 2013-10-13. ^ Emma O’Brien & Artyom Danielyan. "Yuan-Ruble Trading Starts on Moscow's Micex as Russia, China Shun Dollar". Bloomberg News. Retrieved 2013-10-13. ^ "China and Japan plan direct currency exchange agreement". BBC. 2011-12-26. Retrieved 2013-10-13. ^ Kosuke Takahashi. "Japan, China bypass US in currency trade". Asia Times Online. Retrieved 2013-10-16. ^ "China and Australia Announce Direct Currency Trading". National Library of Australia. Archived from the original on 2013-06-21. Retrieved 2013-10-16. ^ "UK and China in £21bn currency swap deal". BBC. 2013-06-23. Retrieved 2013-10-13. ^ "ECB and the People's Bank of China establish a bilateral currency swap agreement". European Central Bank. Retrieved 2013-10-13. ^ Tom McGregor (15 October 2015). "China international payments system goes into action". CNTV. Archived from the original on 21 August 2016. Retrieved 22 December 2018. ^ Gabriel Wildau (2015-10-08). "China launch of renminbi payments system reflects Swift spying concerns". Financial Times. ^ "Press release". International Monetary Fund. ^ "The Use of RMB in International Transactions" (PDF). Retrieved 2016-07-02. ^ Barboza, David (2011-02-11). "In China, Tentative Steps Toward a Global Currency". The New York Times. ^ "China, Japan to launch yuan-yen direct trading". Xinhuanet. 30 May 2012. Archived from the original on 2 June 2012. Retrieved 10 June 2012. ^ "ANZ, Westpac to lead Chinese currency conversion". Australian Broadcasting Corporation. 2013-04-08. Retrieved 2013-04-08. ^ "Designated Foreign Currencies - Central Bank of Sri Lanka" (PDF). Central Bank of Sri Lanka. 27 October 2011. Archived from the original (PDF) on 2 February 2014. Retrieved 24 January 2014. ^ "Bank of China to serve as yuan clearing bank in S. Africa". Xinhua. 2015-07-08. Retrieved 2015-07-22. ^ Cookson, Robert (2010-07-28). "China revs up renminbi expansion". The Financial Times. ^ Brown, Kevin; Cookson, Robert; Dyer, Geoff (2010-09-19). "Malaysian bond boost for renminbi". The Financial Times. Asia-Pacific. Retrieved 2013-10-07. ^ "ธปท.หาทางถ่วงน้ำหนักทุนสำรองหลังดอลลาร์สหรัฐผันผวน" [BOT. Weighted for the reserves after the US dollar volatility.]. MCOT. Archived from the original on 26 September 2011. Retrieved 30 April 2011. ^ Bradsher, Keith (November 30, 2015). "China's Renminbi Is Approved by I.M.F. as a Main World Currency". New York Times. Retrieved 22 August 2018. ^ Laje, Diego (29 September 2011). "China's yuan moving toward global currency?". CNN Business. Archived from the original on 1 October 2011. ^ "Chinese yuan penetrates African markets". 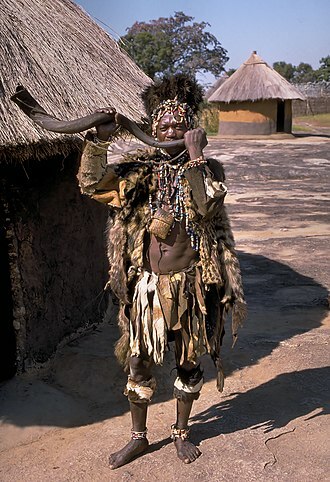 African Renewal. August 2014. ^ "The Basic Law of the Hong Kong Special Administrative Region of the People's Republic of China". 1990-04-04. Retrieved 2007-03-23. Article 18: National laws shall not be applied in the Hong Kong Special Administrative Region except for those listed in Annex III to this Law. ^ "The Basic Law of the Macao Special Administrative Region of the People's Republic of China". 1993-03-31. Retrieved 2007-03-23. Article 18: National laws shall not be applied in the Macao Special Administrative Region except for those listed in Annex m to this Law. ^ "Hong Kong banks to conduct personal renminbi business on trial basis". Hong Kong Monetary Authority. 2003-11-18. Retrieved 2007-03-22. ^ "Bank of China New York Offers Renminbi Deposits". Retrieved 2011-02-15. ^ "Macao gets green light for RMB services". China Daily. 2004-08-05. Retrieved 2007-03-22. ^ "Regular Press Briefing of the Mainland Affairs Council". Mainland Affairs Council. 5 January 2007. Archived from the original on 2007-09-27. Retrieved 2007-03-21. ^ "CBC head urges immediate liberalization of reminbi conversion". Government Information Office, Taiwan. 26 December 2006. Archived from the original on 7 February 2007. Retrieved 21 March 2007. ^ "Taiwan prepares to allow renminbi exchange". Financial Times. 3 January 2007. Retrieved 2007-03-13. ^ "Widely used in Mongolia". chinanewswrap.com. 2009-05-07. Archived from the original on 2012-02-25. ^ "Asian Monetary Cooperation: Perspective of RMB Asianalization" (PDF). ^ "Hong Kong's first renminbi IPO raises $1.6bn". Financial Times. ^ Hui, Daniel; Bunning, Dominic (1 December 2010). "The offshore renminbi" (PDF). HSBC. Archived from the original (PDF) on 22 October 2012. Retrieved 14 July 2012. ^ "The birth of a new currency". Treasury Today. May 2011. Archived from the original on 22 August 2018. Retrieved 22 August 2018. 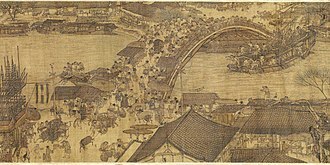 Wikimedia Commons has media related to Money of China. Ancient Chinese coinage includes some of the earliest known coins. 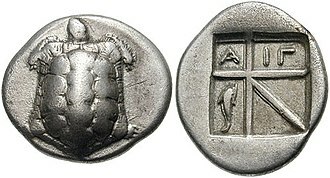 These coins, used as early as the Spring and Autumn period, the Spring and Autumn period saw the introduction of the first metal coins, they were not initially round, instead being either knife shaped or spade shaped. Round metal coins with a round, and later square hole in the center were first introduced around 350 BCE, the beginning of the Qin Dynasty, the first dynasty to unify China, saw the introduction of a standardised coinage for the whole Empire. Subsequent dynasties produced variations on these round coins throughout the imperial period, ancient Chinese coins are markedly different from coins produced in the west. Chinese coins were manufactured by being cast in molds, whereas western coins were cut and hammered or, in times. Chinese coins were made from mixtures of metals such copper and lead, from bronze, brass or iron, precious metals like gold. The ratios and purity of the coin metals varied considerably, most Chinese coins were produced with a square hole in the middle. This was used to allow collections of coins to be threaded on a rod so that the rough edges could be filed smooth. Official coin production was not always centralised, but could be spread over many mint locations throughout the country, aside from officially produced coins, private coining was common during many stages of history. Various steps were taken over time to try to combat the private coining and limit its effects, at other times private coining was tolerated. The coins varied in value throughout the history, some coins were produced in very large numbers – during the Western Han, an average of 220 million coins a year were produced. Other coins were of limited circulation and are extremely rare – only six examples of Da Quan Wu Qian from the Eastern Wu Dynasty are known to exist. Occasionally, large hoards of coins have been uncovered, the earliest coinage of China was described by Sima Qian, the great historian of c. While nothing is known about the use of shells as money, gold. They are not found in hoards, and the probability is that all these are in fact funerary items. 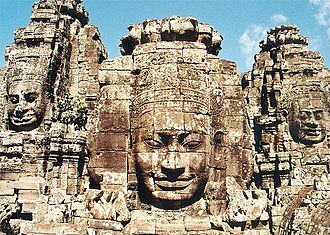 Present day Laos traces its historic and cultural identity to the kingdom of Lan Xang Hom Khao, which existed for four centuries as one of the largest kingdoms in Southeast Asia. 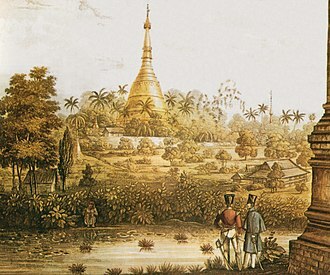 Due to Lan Xangs central geographical location in Southeast Asia, the kingdom was able to become a hub for overland trade. 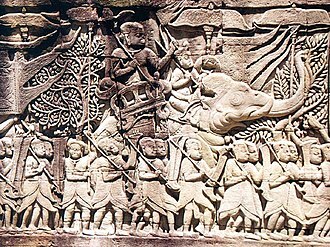 After a period of conflict, Lan Xang broke off into three separate kingdoms— Luang Phabang and Champasak. In 1893, it became a French protectorate, with the three territories uniting to form what is now known as the country of Laos and it briefly gained independence in 1945 after Japanese occupation, but returned to French rule until it was granted autonomy in 1949. Laos became independent in 1953, with a monarchy under Sisavang Vong. 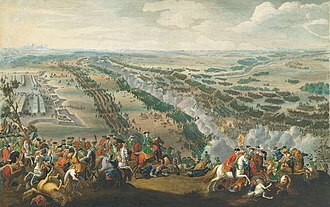 Shortly after independence, a civil war ended the monarchy. Laos is a one-party socialist republic and it espouses Marxism and is governed by the Lao Peoples Revolutionary Party, in which the party leadership is dominated by military figures. 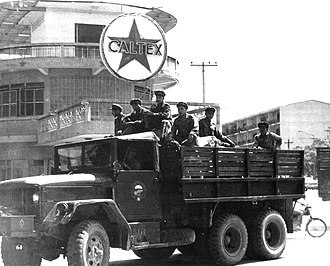 The Socialist Republic of Vietnam and the Vietnam Peoples Army continue to have significant influence in Laos, other large cities include Luang Prabang and Pakse. Laos is a country with the politically and culturally dominant Lao people making up approximately 60 percent of the population. 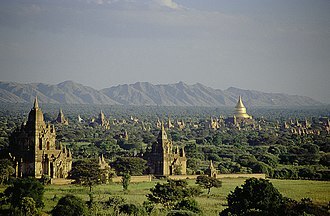 Mon-Khmer groups, the Hmong, and other hill tribes, accounting for 40 percent of the population, live in the foothills. It is a member of the Asia-Pacific Trade Agreement, Association of Southeast Asian Nations, East Asia Summit, Laos applied for membership of the World Trade Organization in 1997, on 2 February 2013, it was granted full membership. According to the anti-corruption non-governmental organisation Transparency International, Laos remains one of the most corrupt countries in the world and this has deterred foreign investment and created major problems with the rule of law, including the nations ability to enforce contract and business regulation. This has contributed to a third of the population of Laos currently living below the poverty line. 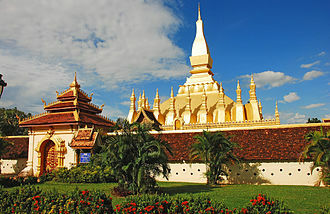 Laos has an economy, with one of the lowest annual incomes in the world. In 2014, the country ranked 141st on the Human Development Index, according to the Global Hunger Index, Laos ranks as the 29th hungriest nation in the world out of the list of the 52 nations with the worst hunger situation. An abbreviation is a shortened form of a word or phrase. It consists of a group of letters taken from the word or phrase, a contraction is an abbreviation, but an abbreviation is not necessarily a contraction. Acronyms and initialisms are regarded as subsets of abbreviations and they are abbreviations that consist of the initial letters or parts of words. Abbreviations have a history, created so that spelling out a whole word could be avoided. This might be done to time and space, and to provide secrecy. Shortened words were used and initial letters were used to represent words in specific applications. In classical Greece and Rome, the reduction of words to single letters was common, in Roman inscriptions, Words were commonly abbreviated by using the initial letter or letters of words, and most inscriptions have at least one abbreviation. However, some could have more than one meaning, depending on their context, Abbreviations in English were frequently used from its earliest days. Manuscripts of copies of the old English poem Beowulf used many abbreviations, for example 7 or & for and, the standardisation of English in the 15th through 17th centuries included such a growth in the use of abbreviations. At first, abbreviations were sometimes represented with various suspension signs, for example, sequences like ‹er› were replaced with ‹ɔ›, as in ‹mastɔ› for master and ‹exacɔbate› for exacerbate. While this may seem trivial, it was symptomatic of an attempt by people manually reproducing academic texts to reduce the copy time, an example from the Oxford University Register,1503, Mastɔ subwardenɔ y ɔmēde me to you. And wherɔ y wrot to you the last wyke that y trouyde itt good to differrɔ thelectionɔ ovɔ to quīdenaɔ tinitatis y have be thougħt me synɔ that itt woll be thenɔ a bowte mydsomɔ. The Early Modern English period, between the 15th and 17th centuries, had abbreviations like ye for Þe, used for the word the, hence, by misunderstanding, during the growth of philological linguistic theory in academic Britain, abbreviating became very fashionable. The use of abbreviation for the names of J. R. R. Tolkien and his friend C. S. Lewis, but before that, many Britons were more scrupulous at maintaining the French form.